Julie Packard is executive director of the Monterey Bay Aquarium, which she helped found in the late 1970s. She is an international leader in the field of ocean conservation, and a leading voice for science-based policy reform in support of a healthy ocean. Under her leadership, the Aquarium has pioneered innovative exhibits and education initiatives, and has evolved into one of the nation’s leading ocean conservation organizations through its respected Seafood Watch program, its activities on behalf of ocean policy reform, and field research that is illuminating the conservation challenges facing sea otters, great white sharks and Pacific bluefin tuna in the wild. Julie is also a leader in ocean conservation worldwide, and brings a lifelong passion for the natural world to her service with many organizations dedicated to conservation activities. 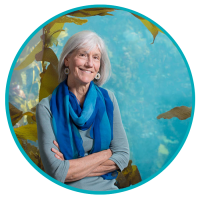 She is a trustee of the David and Lucile Packard Foundation, and chairs the Board of the Monterey Bay Aquarium Research Institute (MBARI), a world leader in deep-ocean science and technology. The 1998 recipient of the Audubon Medal for Conservation, she was elected in 2009 as a Fellow of the American Academy of Arts and Sciences and was named a 2009 California Coastal Hero by the California Coastal Commission and Sunset magazine. In 2010, Julie was honored by the National Marine Sanctuary Foundation for her commitment to ocean sustainability and leadership. In 2013, she was named to California’s Parks Forward Commission, a group charged with crafting a blueprint for the future of the state’s park system. Julie was a member of the Pew Oceans Commission and serves on the Joint Oceans Commission Initiative, where she works to implement comprehensive reform of U.S. ocean policy. She has addressed ocean issues as a featured speaker at international conferences, including the World Trade Organization, the International Aquarium Congress and the Seafood Summit. A marine biologist, Julie earned both a bachelor’s degree and master’s degree in biology from the University of California, Santa Cruz, with a focus on marine algae.